The Virus Expansion expands upon the base game for Cytosis. The expansion add Influenza, Rhino Virus and Ebola. Player may pay ATP to build up their antibodies to each of the three viral strains. 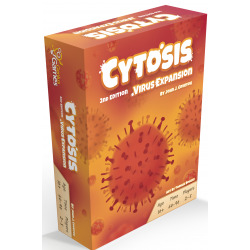 When a Virus attacks, all player will roll a number of antibody dice according to their level of health and add it to the antibodies they've accumulated throughout the game.